Couple slabs for ID help. 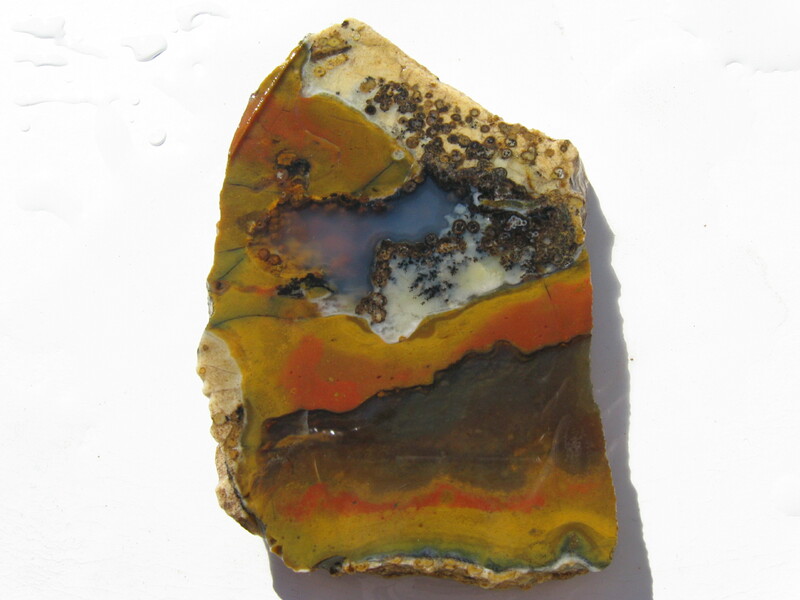 jasper to me, but also looks like pictures I have seen of Kona Dolomite. The 3rd picture is some sort of jasper agate, any ideas? 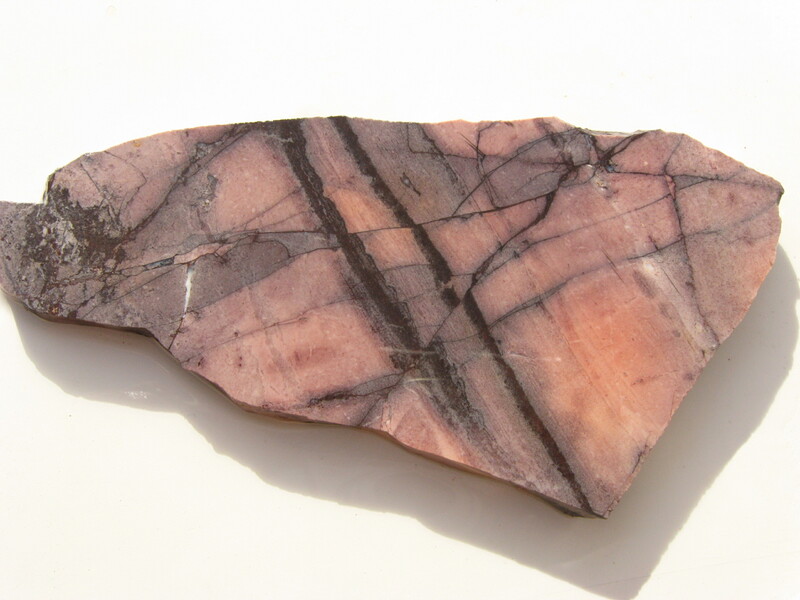 First certainly looks like rhodonite, though that would have a Mohs of just under 7. Second almost looks like a thunderegg core, but no shell so probably not. I'd also considered brecciated rhyolites and feldspars, but like the dolomite you mentioned, both would be softer than Mohs 7. Those black lines would seem to indicate manganese (rather than something like iron) doing the coloring. 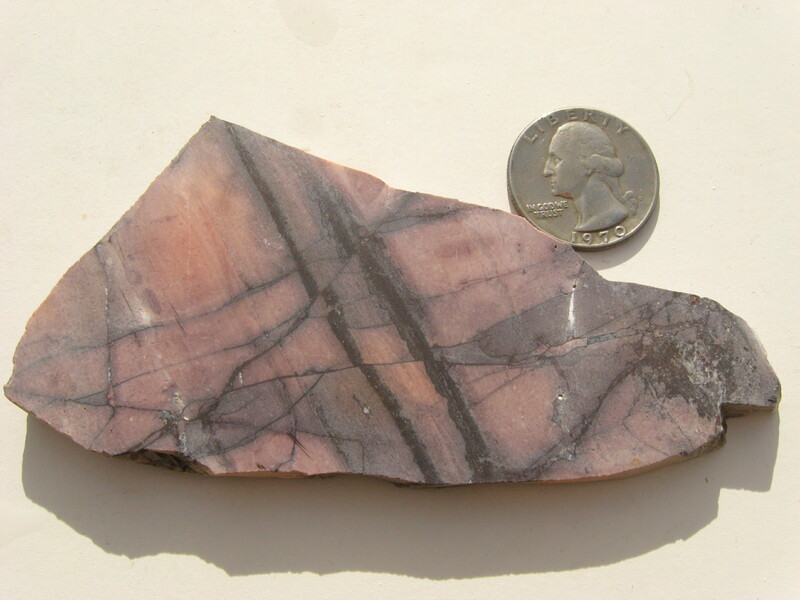 The other pink mangan-bearing minerals Mohs 7+ that I can think (e.g., chambersite or povondraite) are found as small crystals within softer material that would be easily scratched by quartz. I hope someone else can ID a possibility for you. 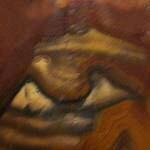 The pattern of the first one does resemble Kona Dolomite, but the Kona I have worked is much softer--around 5.5. Yep, the first really does look like marble (dolomite) bit at 7+ it just about has to be a quartz variant. The 2nd one is almost certainly polka dot agate. Specifically from the area where the Native Americans were heating it for arrowheads. We have a bit of the material from that hillside. The first one could also be orthoclase.